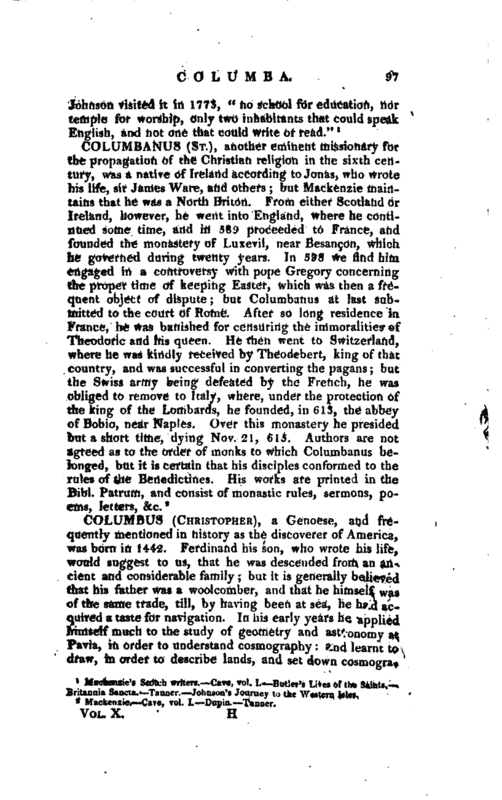 , a Genoese, and frequently mentioned in history as the discoverer of America, was born in 1442. Ferdinand his son, who wrote his life, would suggest to us, that he was descended from an ancient and considerable family; but it is generally believed that his father was a woolcomber, and that he himself was of the same trade, till, by having been at sea, he had acquired a taste for navigation. In his early years he applied himself much to the study of geometry and astronomy at Pavia, in order to understand cosmography: and learnt to draw, in order to describe lands, and set down | cosmographical bodies, plains, or rounds. He went to sea at the age of fourteen: his first voyages were to those ports in the Mediterranean frequented by the Genoese; after which he took a voyage to Iceland; and proceeding still further north, advanced several degrees within the polar circle. After this, Columbus entered into the service of a famous sea-captain of his own name and family, who commanded a small squadron fitted out at his own expence; and by cruising against the Mahometans and Venetians, the rivals of his country in trade, had acquired both wealth and reputation. With him Columbus continued for several years, no less distinguished for his courage than his experience as a sailor. At length, in an obstinate engagement, off the coast of Portugal, with some Venetian caravals returning richly laden from the Low Countries, his ship took fire, together with one of the enemy’s ships to which it was first grappled. Columbus threw himself into the sea, laid hold of a floating oar, and by the support of it, and his dexterity in swimming, reached the shore, though above two leagues distant. 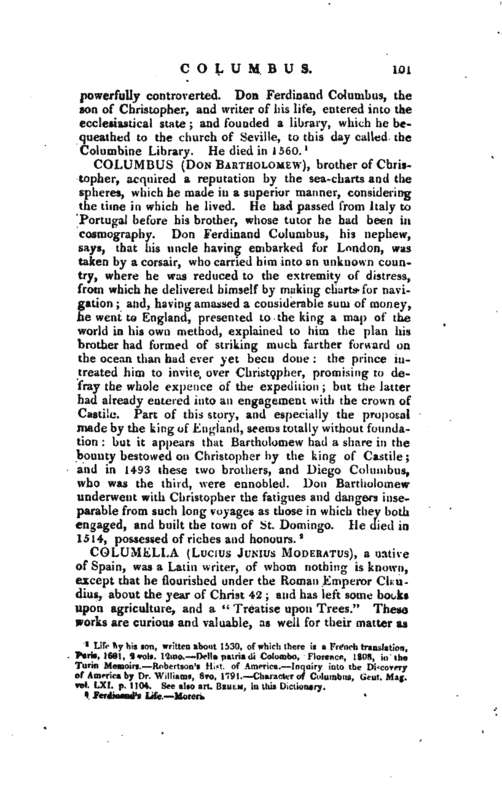 After this disaster he went to Lisbon, where he married a daughter of Bartholomew Perestrello, one of the captains employed by Prince Henry in his early navigations, and who had discovered and planted the islands of Porto Santo and Madeira, and by getting possession of his journals and charts, Columbus was seized with an irresistible desire of visiting unknown countries. He first made a voyage to Madeira; and continued during several years to trade with that island, the Canaries, Azores, the settlements in Guinea, and all the other places which the Portuguese had discovered on the continent of Africa. By these means he soon became one of the most skilful navigators in Europe. At this time the great object of discovery was a passage by sea to the East Indies, which was at last accomplished by the Portuguese, by doubling the Cape of Good Hope. 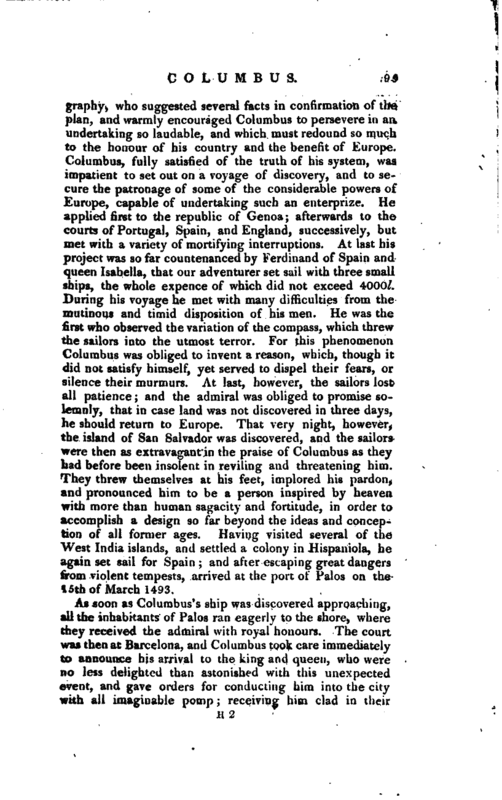 The danger and tediousness of the passage, however, induced Columbus to consider whether a shorter and more direct passage to these regions might not be found out; and at length he became convinced that, by sailing across the Atlantic Ocean, directly towards the West, new countries, which probably formed a part of the vast continent of India, must infallibly be discovered. In 1474, he communicated his ideas on this subject to one Paul, a physician in Florence, a man eminent for his knowledge in | cosmography, who suggested several facts in confirmation of the plan, and warmly encouraged Columbus to persevere in an undertaking so laudable, and which must redound so much to the honour of his country and the benefit of Europe. Columbus, fully satisfied of the truth of his system, was impatient to set out on a voyage of discovery, and to secure the patronage of some of the considerable powers of Europe, capable of undertaking such an enterprize. He applied first to the republic of Genoa; afterwards to the courts of Portugal, Spain, and England, successively, but met with a variety of mortifying interruptions. At last his project was so far countenanced by Ferdinand of Spain and queen Isabella, that our adventurer set sail with three small ships, the whole expence of which did not exceed 4000l. During his voyage he met with many difficulties from the mutinous and timid disposition of his men. He was the first who observed the variation of the compass, which threw the sailors into the utmost terror. For this phenomenon Columbus was obliged to invent a reason, which, though it did not satisfy himself, yet served to dispel their fears, or silence their murmurs. At last, however, the sailors lost all patience; and the admiral was obliged to promise so r lemnly, that in case land was not discovered in three days, he should return to Europe. That very night, however, the island of San Salvador was discovered, and the sailors were then as extravagant in the praise of Columbus as they had before been insolent in reviling and threatening him. They threw themselves at his feet, implored his pardon, and pronounced him to be a person inspired by heaven with more than human sagacity and fortitude, in order to accomplish a design so far beyond the ideas and conception of all former ages. Having visited several of the West India islands, and settled a colony in Hispaniola, he again set sail for Spain; and after escaping great dangers from violent tempests, arrived at the port of Palos on the 15th of March 1493. As soon as Columbus’ s ship was discovered approaching, all the inhabitants of Palos ran eagerly to the shore, where they received the admiral with royal honours. The court was then at Barcelona, and Columbus took care immediately to announce his arrival to the king and queen, who were no less delighted than astonished with this unexpected event, and gave orders for conducting him into the city with all imaginable pomp receiving him clad in their | royal robes, and seated on a throne under a magnificent canopy. Notwithstanding all this respect, however, Columbus was no longer regarded than he was successful. The colonists he afterwards carried over were to the last degree unreasonable and unmanageable; so that he was obliged to use some severities with them; and complaints, were made to the court of Spain against him for cruelty. On this, Francis de Bovadilla, a knight of Calatrava, was appointed to inquire into the conduct of Columbus; with orders, in case he found the charge of mal-administration, proved, to supersede him, and assume the office of governor of Hispaniola. The consequence of this was, that Columbus was sent to Spain in chains. From these, however, he was freed immediately on his arrival, and had an opportunity granted him of vindicating his innocence. He was, however, deprived of all power; and notwithstanding his great services, and the solemnity of the agreement between him and Ferdinand, Columbus never could obtain the fulfilment of any part of that treaty. At last, disgusted with the ingratitude of a monarch whom he had served with such fidelity and success, and exhausted with fatigues, he died May 29th, 1506. Ferdinand, who had slighted his well-founded claims when living, bestowed upon him funeral honours, and confirmed to his children their hereditary rights. 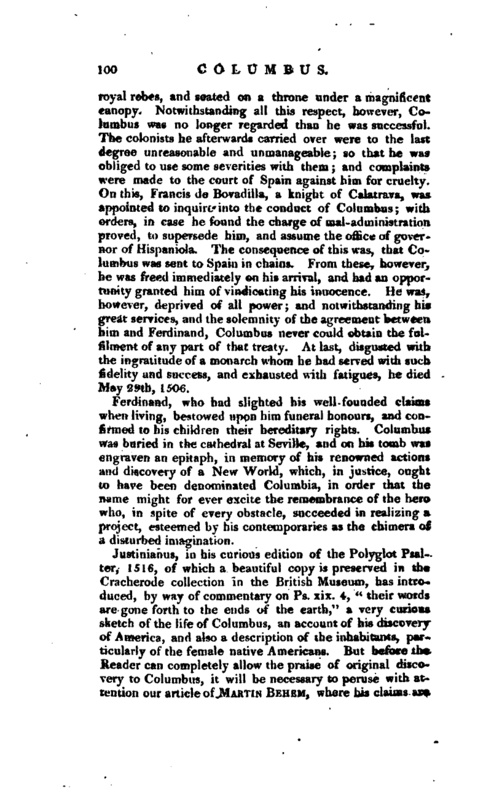 Columbus was buried in the cathedral at Seville, and on his tomb was engraven an epitaph, in memory of his renowned actions and discovery of a New World, which, in justice, ought to have been denominated Columbia, in order that the name might for ever excite the remembrance of the hero who, in spite of every obstacle, succeeded in realizing a. project, esteemed by his contemporaries as the chimera of a disturbed imagination. Life By his son, written about 1530, of which there is a French translation, Paris, 1681, 2 vols. 12mo.—Delia patria di Colombo, Florence, 1808. in the Turin Memoirs.—Robertson’s Hist. 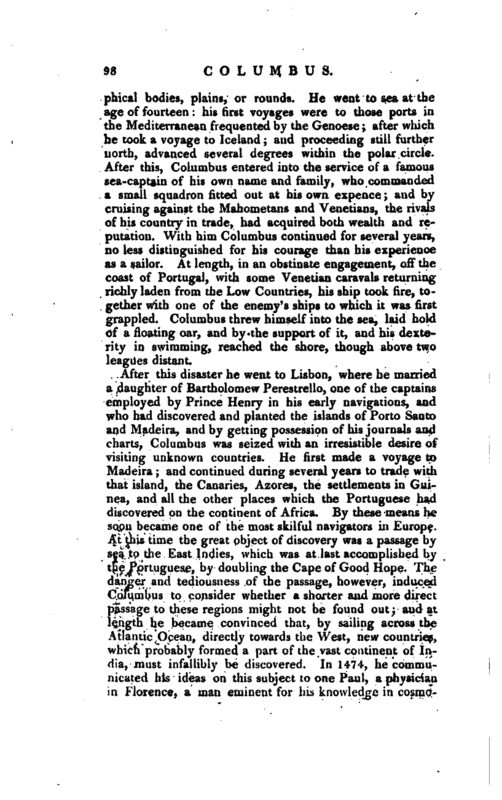 of America.—Inquiry into the Discovery of America by Dr. Williams, 8vo, 1791.—Character of Columbus, Gent. Mag. vol. LXI. p. 1104. See also art. Behem, in this Dictionary.